If you are waiting for the most exciting catch of your life, the state of New York might be one of the best places to explore. The state boasts of 7,500 lakes and ponds, 70,000 miles of rivers and streams, and a coastline that stretches across thousands of miles. Together, the waterways are home to 165 different species of fish. Although that is enough to entice any avid angler, the state has more in store in the form of improved state policies and funding. In the recent past, the state has dedicated more than $10 million for the betterment of hatcheries and public access to fishing locations. The state has also reduced lifetime, annual, and weekly fishing license fees that will let fishing enthusiasts enjoy the activity at a much lower cost. If you are a New York resident with a lifetime license you may also be able to secure an Adventure License. Even more, four of the Bassmaster’s top 50 bass lakes can be found in New York. If all these are making you reach out for your fishing rod and bait, just wait until you read about the best spots for a good catch. Lakes Erie and Ontario, and the Niagara and St. Lawrence rivers offer a sea of opportunity for anglers. 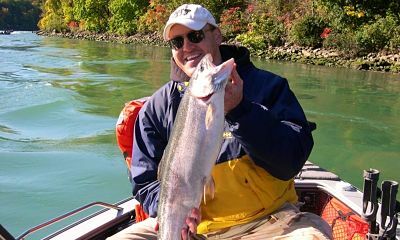 Do not be surprised if you manage to catch a steelhead that is more than 20 pounds or a northern pike that is longer than your arm. 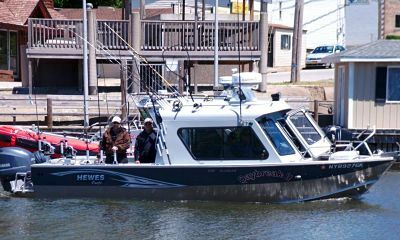 Thanks to the many trophy-rich tributaries and more than 500 miles of shoreline, record-breaking catches that might be rare elsewhere is the norm in the Great Lakes. After all, the Great Lakes have given New York their 14 state-record fish. Apart from a memorable fishing experience, the place is easily accessible round the year. Plus, you also get every kind of facility you need right from fishing guide services, information hotlines, public boat launches, and marinas, to fishing piers, fish cleaning stations, campsites, and bait and tackle shops. The waters of the Great Lakes offer you one of the widest variety of fish including coho salmon, chinook salmon, Atlantic salmon, brown trout, steelhead, northern pike, smallmouth bass, largemouth bass, walleye, muskellunge, many popular panfish, bullhead, channel catfish, common carp, yellow perch, and more. Every year the New York State Department of Environmental Conservation (DEC) and the U.S. Fish and Wildlife Service stock more than four million trout and salmon in the Great Lakes waters. However, striking a gold pot in fishing here still depends upon a little secret: being at the right place at the right moment. It is always better to check with the New York State Fishing Regulations Guide for a comprehensive understanding of the seasons, and for the creel and the size limits for the body of water you are fishing. Both shore and boat fishing are equally popular in the region. The latter is especially popular while fishing for trout and salmon during the spring and fall. Bankside fishing is the more common choice if you are targeting to get hold of a world famous St. Lawrence River carp. The 11 lakes of this region present an amazing fishing opportunity. The lakes that vary in size from 642 acres (Canadice Lake) to a massive 43,342 acres (Seneca Lake) and in depth from 30 feet (Honeoye Lake) to 650 feet (Seneca Lake) will let you enjoy both warm water and cold water fishing. The fishing technique here varies too. Based upon your preference you may choose to sit on the shore fishing with a bobber or handline copper or deep troll with down-riggers. Brown trout, rainbow trout, Atlantic salmon, and lake trout are the most common species to be found here. Skaneateles, Owasco, Cayuga, Seneca, Keuka, Canandaigua, Canadice and Hemlock Lakes are some of the favorite spots for catching lake trout. Rainbow trout too can be found here in abundance especially during the spring tributary fishing in Naples Creek, Catharine Creek, Grout Brook, Cayuga Inlet, Owasco Inlet, Cold Brook Stream (Keuka Lake Inlet), and Springwater Creek. Shore fishing or surface trolling during the spring season might fetch you brown trout. 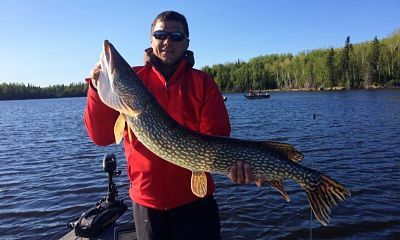 Popular warm water fish that you can find here includes black bass (smallmouth and largemouth), walleye, yellow perch, northern pike and chain pickerel. While the relatively deeper areas of Seneca, Canandaigua, Cayuga, Keuka, Skaneateles, Otisco, Owasco and Hemlock are excellent for catching smallmouths, the shallow weedy areas of Cayuga, Otisco, Conesus, and Honeoye are a great choice for the largemouth. The Hudson is a popular place to fish for largemouth and smallmouth bass. Look for the fish around the tributary mouths and in-river structures such as immersed logs. The best time to fish in these waters is during summer and fall. 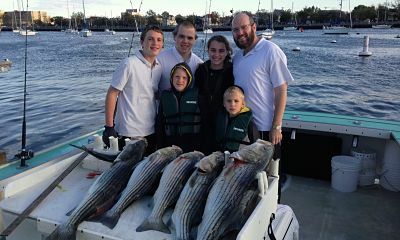 Fishing during the springs yields striped bass. You can find the catch from below the Troy Dam to the New York City area. Your best choice is to use minnow imitating plugs or cast bait of cut or live herring. You can find plenty of smallmouth bass and walleye downstream of Lordville. Go upstream for brown and rainbow trout. You can also find these two varieties in the branches below Cannonsville and Pepacton Reservoirs. You can also fish for the upstream-migrating American shad during the spring season. Remember to use small spinners, jigs (shad darts) and streamer flies when you do so. Just like countless other activities that the city offers, it is also a paradise for recreational anglers. With more than 500 miles of shoreline surrounding this place, New York City can open up a treasure trove of fishing adventures for you. All you need to know are a few spots. Each borough is unique and so is the fishing experience that it offers, giving you the chance to choose anything from a serene beach to an urban pier. There are even places such as the Indian Lake at the Crotona Park in Bronx that are great for kids to fish. It has a good stock of panfish such as perch, catfish, and bluegill sunfish. If you are looking to go bass fishing, you should check out the Prospect Park Lake in Brooklyn. Considered by many as the city’s best bass fishing location, this 55-acre lake is worth giving a try. If peace and quiet is all you are looking for without really leaving the city bounds, visit Wolfe’s Pond in Staten Island. You will be greeted with wooded shoreline and lily pads that will make fishing in this secluded spot a thing to remember. The city, like the state, hides many more gems as far as fishing is concerned. All you need to do is grab your fishing equipment and start exploring! If you love fishing, the state of New York will never disappoint you. It does not matter whether you are an expert or a novice; the state has something for all. Freshwater fishing finds some of the best spots in the state. It is also a great place for fly fishing, saltwater fishing, deep sea fishing, and even ice fishing. From huge lakes to small ponds, the beautiful waterways of the state wait for you with the promise of your next big catch.